I must say, 2018 seemed somewhat of a strange year for residential sales in the five main areas we normally cover. In looking at the graph we generate each month, one may get a clue why. The first half of the year was very busy and strong in sales – especially July which was outstanding. Since midsummer sales slowed, and seemed to really slowdown in the last quarter. 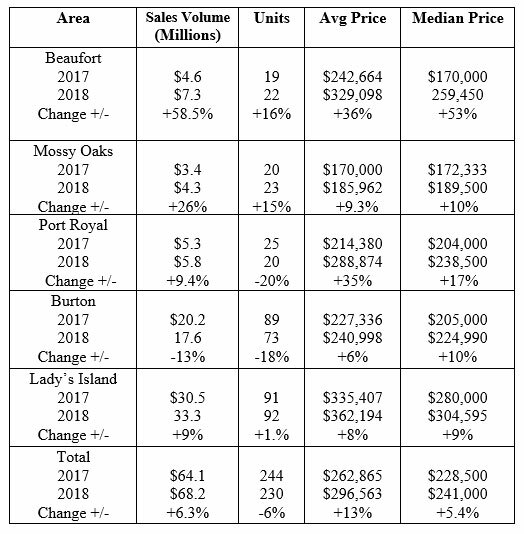 But when one looks at the actual sales graph, only February and June were below 2017 – which was a very good for Beaufort real estate. Other factors could be affecting sales…the increase mortgage rates over the last year obviously does not help. Although we older folks who can remember rates of 14% feel todays interest rates of around 5% to be very competitive. Looking at the above columns, unit sales were down - 6% overall, but sales price increases was up in every location in both “average” + 13% and “median” + 5.4% columns. City of Beaufort had an outstanding last quarter. Big gains in every column, especially sales price increases. Actual unit sales were up +16% which equated to +3 sales. Mossy Oaks is a very established area, with little new construction to drive up sales, but Mossy Oak did have a pretty good quarter. Again + signs in all columns, with the “average” and “median” prices up +9.3% and +10% respectively. Port Royal. Was the one of two areas that saw sales units dip at -20% (-5) units. Then again “average” prices up a strong +35%, with the “median” up +17%. Lack of lower priced inventory may have contributed to the drop in unit sales. Burton has been a real estate hot spot in Northern Beaufort County for some time now, usually only trailing Ladys Island in performance. The last quarter was not quite so kind to Burton. Unit sales down -18% (-16). The good news is “average” and “median” prices up +6% and +10% respectively. Lady’s Island was again the area to beat – with unit sales of 92, almost the same as last year. Impressive sales price gains though with “average” up +8% ($362,194) and the “median” up +9% ($304, 595). Interesting to see Lady’s Island was the only area with a median sales price over $300,000. We hope to have a review the whole real estate year of 2018 in next month’s article, but if the total year is anything like the last quarter of 2018, we all should be comforted that Northern Beaufort County will maintain it’s steady as she goes real estate market.